Introducing the Noem range in the 2018 London Design Fair. Carl, Rachel, Jane and Chico, the new members of the Noem family, have been presented in the London Design Fair last week! Showed in a space shared with other colleagues from our city under the motto Inspired in Barcelona: Design Editions organized by the Barcelona Design Center, this fair allowed us to reveal these news products for the first time! Here is a summary of the most important things we have lived these days accompanied by a virtual tour of the exhibition. Enjoy! If you follow us in social networks, maybe you already know that the names of the Noem pieces are borrowed from great personalities who fought for the environment and social causes that inspired us. To choose these names has involved some discussions about which figures we wanted to highlight and has let us to learn about very inspiring people. It allows us to explain the Noem Family Ethics and its commitment with sustainable design. Noem is a responsible creation that surprised in the LDF2018 and wasn’t probably expected there. Indeed, we were one of the rare exhibitors working under those criterias! An upholstery armchair inviting you to touch! Another discovery and revelation, the upholstered armchair. The colors, the shape, the texture made it the piece with more success of the range. The quality of the fabric invited people to touch it, to try it and to sit on it. Carl, our Armchair, has created convivial moments and warm exchanges about the range. Our product is proud to share these values and create moments like these! Seeing the success we will push ourselves to develop more upholstered pieces as soon as possible! An accurate design from the global shape to the smallest joint. Last but not least, the details of the design. The material finishes, the visible steel structure, the choice of colors and the geometric and playful shapes were particularly appreciated. 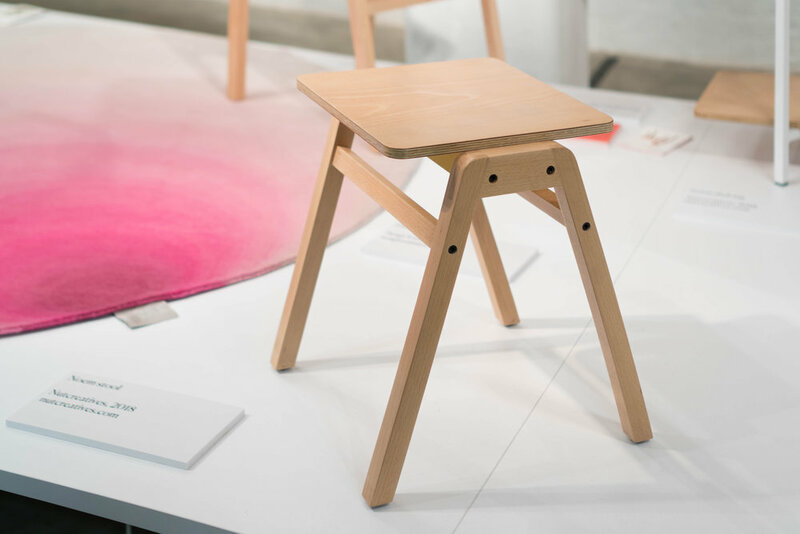 A special mention for the joints of our stool, Chico, which was selected as one of the most beautiful joints of the exhibition by one of our visitors! A refreshing and enriching atmosphere. To conclude, an experience full of emotion and discovery, a lively and welcoming London neighborhood, some great curry in sauce, some pizzas and beers, modern and talented exhibition's neighbors, curious and interested visitors ... In short, we ended this experience tired but at the same time full of energy, inspirations and interesting feedbacks for the future of the Noem range! Maybe thanks to you, one day, we will see the upholstery declined to other models or some joints will become more visible... Stay tuned! We hope you liked this summary; stay tuned because Carl, Rachel, Jane and Chico will be in our online store soon! As you probably know Nutcreatives is much more than just a product design studio. We are really interested in the future of our profession, and to set the bases of it nothing better than to do research. We are one of the partners of the Circular Design Europe project, that has been presented to the media just now. Our role in this network of universities, companies and design associations from four different european countries is to develop a case study publication in Circular Design, looking for some of the best examples in the EU, interviewing them and trying to explain their methodology to help the design community into the acquisition of this set of tools that is going to be every day more important. Here you have the press note that has been sent to media of the whole Europe, together with the first case of study, Sea2see, a Barcelona company that is producing a range of glasses produced with recycled plastic obtained from old fishing nets. Sea2See, a company within the eyewear industry, is one of the case studies showcased within the Circular Design project that demonstrates that every sector can be an agent of change for circular economy. One of the main goals of the European project Circular Design - Learning for Innovative Design for Sustainability is to inspire designers, businesses and design students in the process of developing more sustainable products and services. In order to reach this objective, one of the key outcomes of the project is the Best Practice Publication in Circular Design, a fine selection of case studies, best practices and products that will help us to understand the critical role of design to minimise the environmental impact of consumption, reduce the use of resources and rethink the way our societies work. The first case study of this publication, led by the design studio Nutcreatives in collaboration with the other partners that integrate the Circular Design project, is Sea2See, a change agent in the eyewear industry that is determined to face a very serious threat for our environment: the islands of waste created by the fishing nets thrown away in the ocean that trap hundreds of thousands of sea mammals and fish. 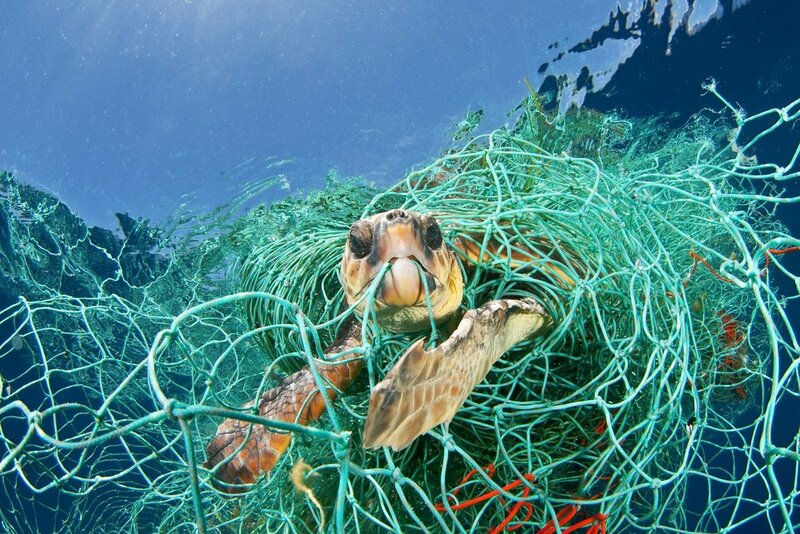 Plastic is also ingested by aquatic animals, such as sea turtles, who mistake it for viable food. They have become a huge environmental problem in our oceans. Sea2see is a company based in Barcelona that produces sustainable eyewear made 100% with recycled fishing nets collected in collaboration with fishermen. One of their main goals is to create awareness about ocean contamination and prove that circular economy in the fashion industry is possible. Sea2See is the first of twelve best practices to be released over the next months. The Best Practice Publication in Circular Design will be completed with case studies within sectors like technology, furniture, clothing, lighting or packaging, to demonstrate that circular design strategies can be applied to improve the efficiency of almost every system. Last week we had an interview about sustainable packaging for BeOK, a program in la Ser, one of the most important radio stations in Spain. In it Àlex Jiménez talks about how design can improve the environmental impact of packaging, materials, the process to design a more sustainable packaging, consumer behaviour, etc. In this link you can listen to it, do it and tell us what you think! La semana pasada nos hicieron una entrevista sobre packaging y sostenibilidad en BeOK, un programa sobre alimentación saludable en la Ser. En ella Àlex Jiménez habla sobre cómo el diseño puede mejorar el impacto ambiental del packaging, materiales, el proceso para diseñar un envase más sostenible, patrones de consumo, etc. En este link la podéis escuchar. ¡Hacedlo y decidnos qué pensáis! If you follow us you probably know that since our beginning in 2009 we have always been very interested in design teaching and theory. One of our favourite sports is to grab a coffee/beer/wine and to spend a couple of hours solving the world, from the design point of view of course, but not only! We have years of experience giving lectures, workshops, classes and writing articles about design, sustainability and more in many different scenarios. We strongly believe that before acting you always have to think, but not too much, balance is the key! A couple of months ago we had to write a critical article about our vision about the design sector and the design teaching in the following years for an university of Italy, and we want to share with you the parts that were not specifically written for them! 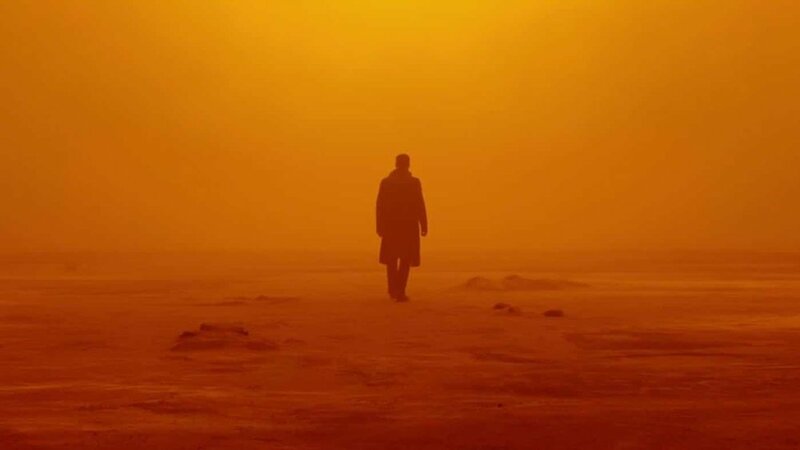 Without going as far as the 2049, because things happen every day faster, we want to show you our vision about the close future of our profession. We hope you take it as an open opinion, that it stimulates yours and of course that you share with us what you think about it! The tradition of design talks mostly about four disciplines: graphic, product, interiors, and fashion, but this division is nowadays obsolete like the offer of grades and postgraduates of most of the design schools abroad demonstrates: food design, retail design, jewelry, art management, packaging design, sustainable design, coolhunting and trends, brand management, and the list can continue forever! Today design is something much more complex and has evolved to many more shapes than the traditional four categories, that of course are still alive. There are designers who have learnt to program, and their work is something in between product design and robotics, or even art, others work in restaurants collaborating with chefs or with scientists or doctors in a laboratory... Graphic designers use every day more 3D, photography and also programming to develop things that are much more dynamic (apps, videos, animation, etc.) than the graphic design of 30 years ago. It happened the same with fashion, new textiles and technologies are making possible the development of wearables, smart clothes that have many more functionalities than the traditional ones, and fashion designers have a lot to say there. The integration of technology in almost every aspect of our lives is one of the main trends that any design learning program should include, but sustainability and social responsibility are probably even more important. They are actually having an enormous influence in consumer behaviour, and this situation will grow. This is said in the most renowned trend/design reports like Nelly Rodi or David Carsson report and you can see the influence even in sectors as automotive, fashion or packaging. It's a big change, and designers -in collaboration with environmentalists, engineers, etc.- are the ones who can apply these criteria in a more natural and integrated way. The third tool that we think every designer should have nowadays besides the traditional design skills is business. There are lots of designers/makers selling directly their creations in collaboration of artisans or little suppliers, something that has traditionally happened in fashion but maybe not as much in product or in graphic design. This makes more necessary to have a business vision that it's also helpful in case you are part of a bigger organisation. Design is now inside the management boards of the most innovative companies in the world -the typical example is Apple, but even companies that offer services are using design and designers as a decision tool-, and has become something strategic and never more something only just aesthetic or superficial, that in our opinion it never was! In our opinion, all of these facts are the ultimate demonstration that to design has never been to master a series of tools like non-designers often think. Design is a problem solving methodology, and as it happened before the best designers will always be the ones that have the criteria and the vision to offer the best answers for what the users, the consumers and the clients need, despite the changes that the profession and the world has suffered and will suffer even more in the next years! We started the process to plan our new web in the beginning of 2016. We have been dedicating a lot of time and effort to think which was the best way to present the studio, showing the principles that rule our approach to product design: rich, diverse, ambitious, but also realistic. You probably know that we strongly believe that design is the best tool to improve the environmental and social impact of products, but we also think that it makes them better in every single aspect, from functionality to differentiation or aesthetics. We called the result "the Nutcreatives' manifesto" and you can read it in the first section of the web: "Studio". We hope it inspire you! For us this web has to be the platform to become a company with international impact. Until now we have been doing small attends with international clients -in close european countries mostly- but our activity is still 99% based in Catalonia. This webpage and other tools that we are still developing must push us to make real a process that will finish at the end of 2018, with ideally a more consolidated international presence. Stay aware of our news!